Cast: Morgan Freeman, thousands of penguins. Story: A year in the life of a tuxedo. March of the Penguins is a documentary about Emperor Penguins, shallow in substance but deep in heart and imagery. Already the second biggest grossing documentary of all time in the US (after Fahrenheit 9/11), the penguins are set to march on our soil. Morgan Freeman provides the narration in this chilly tale and, as you would expect, adds a great amount of weight to the penguins' pilgrimage. Rather too much at times, in fact, as you don't need gravitas to enjoy a penguin falling on its arse. The combination of Freeman's commentary and the glorious textured photography makes an immensely watchable icy love story. Love story? 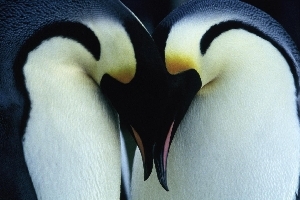 Yes, the penguins show remarkable devotion to their offspring and consequently also to their partner, showing what appears to be human-like emotions during times of turmoil. The movie is pitched very much in this way, showing the creatures at an emotional level rather than a naturalistic one. We don't actually learn a great deal, but we do enjoy watching the epic journeys unfold. The trouble is, we're spoiled by the BBC's constant supply of top-grade documentaries that are visually as good as this, but with the technical back-up to support them. Although March of the Penguins is a splendid achievement, it's not noticeably better than your average Attenborough series, so it's arguable whether you want to spend the time and money going to the cinema for it. March of the Penguins is probably the best wildlife documentary to make a cinema release - but it doesn't have much competition. It's definitely one to recommend for DVD, but I can't honestly urge you to see it on the big screen because of the tremendous quality of today's TV wildlife programmes. If you're not a documentary fan then you'll be bored, however if you're a particularly keen documentary viewer then you may resent the lack of detail. Still jolly good fun though. I think the average moviegoer will enjoy it: 4/5 - though I'd recommend a home viewing rather than a cinema trip. Testosterone Satisfaction Rating: -1/5 - the cold may even make you shrivel up. To enjoy this film you should be: a dip-in documentary buff. March of the Penguins is on limited general release in the UK now, with a wider release in early 2006.